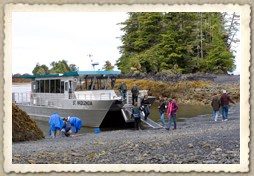 Allen Marine Tours operates a fleet of over 25 vessels, all custom-designed and built specifically to operate in our Southeast Alaska environment. Our vessels come in a wide variety of sizes and capacities – from 150-passenger, high-performance catamarans to 6-person, expedition & transport crafts – we have a vessel to suit almost every kind of cruise or marine transportation service. Our vessels operate year-round in the ports of Juneau, Ketchikan and Sitka. Our 78-foot catamarans are USCG approved to carry up to 145 passengers and capable of cruising at speeds of up to 26-30 knots loaded. The lower/main deck is equipped with three restrooms (one ADA accessible), a galley and ample seating. The topside observation deck is designed to allow passengers to take in the scenic beauty that this region has to offer. Our 65-foot monohull vessel can carry up to 46 passengers at cruising speeds of 26-28 knots. Featuring a spacious main cabin, topside observation deck, a snack & beverage bar, and one restroom, this vessel is perfect for smaller group events and custom sightseeing cruises. Our 48-foot “Adventure Cat” can accommodate group-sizes up to 24 passengers, and she has a service speed of 24-26 knots. Featuring a comfortable main cabin, service bar and restroom, this highly-maneuverable vessel is also equipped with a bow-landing capability, allowing transfer to shore in areas that would be inaccessible by conventional boats. Our 78-foot catamarans are USCG approved to carry up to 140 passengers and capable of cruising at speeds of up to 36 knots loaded. The lower/main deck is equipped with three restrooms (one ADA accessible), a galley and ample seating. The topside observation deck is designed to allow passengers to take in the scenic beauty that this region has to offer. Our 65-foot catamarans can accommodate group-sizes up to 100 passengers, and they have a service speed of 24-26 knots. Featuring two separate viewing decks, a galley, and two restrooms, these vessels provide the ideal venue for an almost limitless variety of cruise events, including: sightseeing tours, receptions, meetings, reunions, field trips and custom/group ferry service. Our 65-foot “Otter Class” vessels can accommodate group-sizes up to 46 passengers, and they have a service speed of 26-28 knots. Featuring a spacious main cabin, topside observation deck, a snack & beverage bar, and one restroom, these vessels are perfect for smaller group events and custom sightseeing cruises. Our 30-foot “Expedition Cat” is designed to carry small groups of six or less. This fast, rugged vessel – the equivalent of a luxurious, aquatic SUV – is equipped with a spacious cabin, service bar, restroom and bow-landing capability. This is the perfect craft for doing family cruises, photo safaris, and remote drop-off transportation for kayak and camping expeditions. * Depending on charter services provided we may not allow the group size to equal the USCG rating. Please consult our charter representative to determine the allowable group size.